Three-minute video shows the transit of Venus, as seen in multiple wavelengths on NASA's Solar Dynamics Observatory. Red, golden and magenta views are in ultraviolet wavelengths (304, 171 and 1700 angstrom, respectively), while the orange sun is filtered visible light. The transit of Venus may be finished until 2117, but videos and pictures of the phenomenon are continuing to gush all over the Internet. If you missed Tuesday's nearly seven-hour astronomical spectacle, you can get up to speed with a 39-second video from NASA's Solar Dynamics Observatory. If you've got a little more time, sit back and watch the three-minute version with a soaring soundtrack. Another time-lapse video from the SDO team lasts just 12 seconds — but it shows one of the most scientifically significant phenomena surrounding the transit: the "Arc of Venus," an interval during which sunlight is refracted around Venus' disk, creating a "ring of fire." Close analysis of the refracted light can provide insights into the dynamics of Venus' mysterious atmosphere. The Hinode sun-observing satellite captured this stunning view of the planet Venus crossing the edge of the sun's disk. 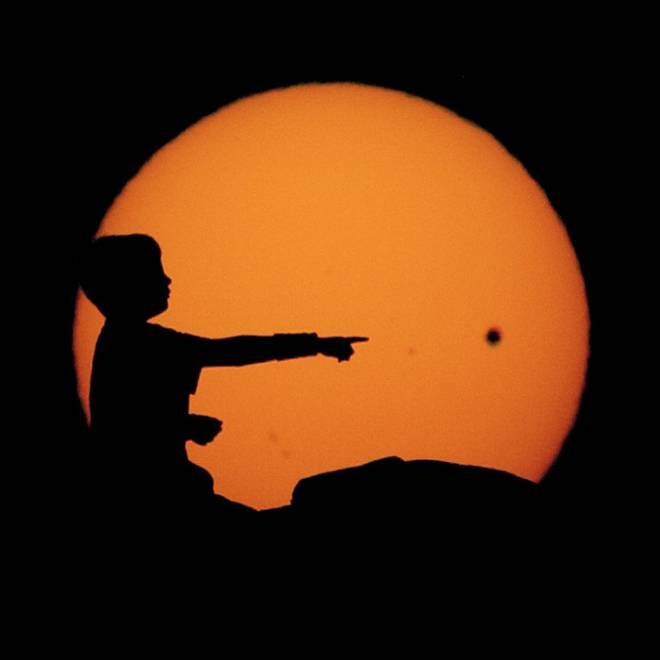 Photographer Jerry Horn took this picture of his son pointing to Venus crossing the face of the sun at sunset, west of Tucson, Ariz. Technical details: Canon 5D Mark II, Canon EF f/4 300mm IS with a 1.4x Extender and B+W 1000x neutral density filter. A pelican and a planet cross the sun in a picture taken by Vik Sridharan in Redondo Beach, Calif. Here are the technical specs: Canon 50D + 70-200 F4L + 1.4TC; UV, Polarizer, and ND400 filters. 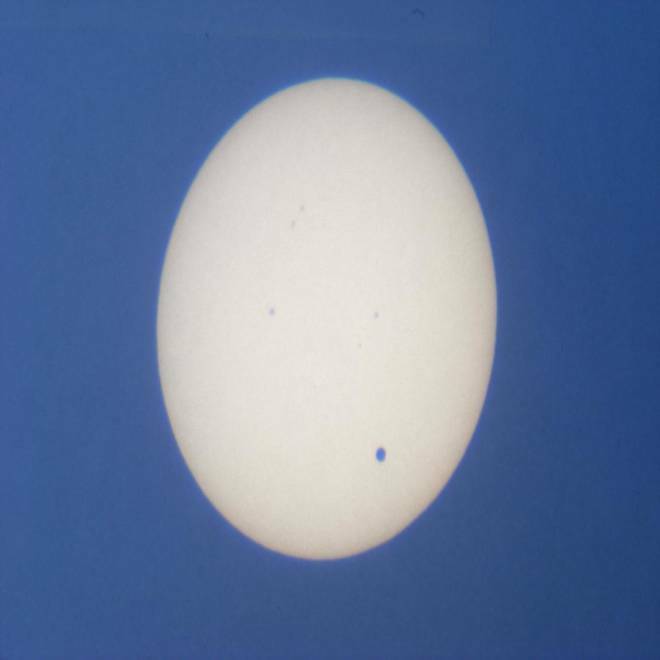 David Fuller says this is his "sun-kissed photo of Venus on the limb of the sun, with sunspots visible in the image." The picture was taken from the Chicago area at 5:22 p.m. CT through a six-inch, f/5 reflector with a white-light solar filter and a smartphone camera, using afocal photography. 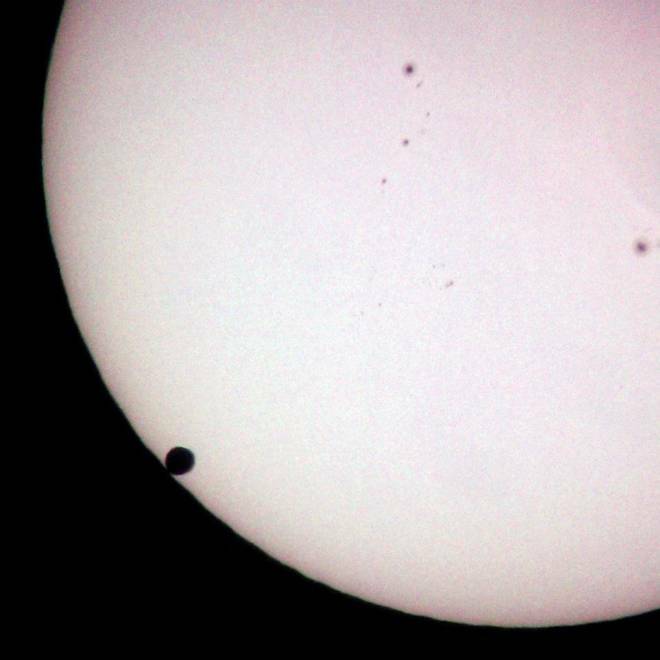 David A. Harvey made careful plans for this picture of the transit. "I was able to compute the place where the sun would set behind the McMath Solar Telescope atop Kitt Peak National Observatory while Venus was still in transit," he writes. Check out Harvey's website for more of his work. 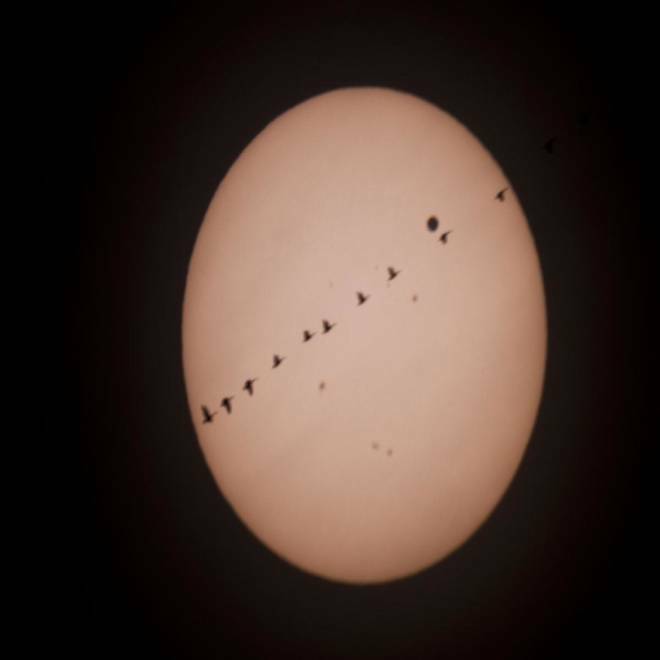 Geese fly in a line over the sun, seemingly dodging the round dot of Venus' disk, in this picture from John Bonnell. Harish Khandrika captured the Venus transit at sunset with a helicopter flying across the sun's disk, at the Torrey Pines Glider Port in La Jolla, Calif. 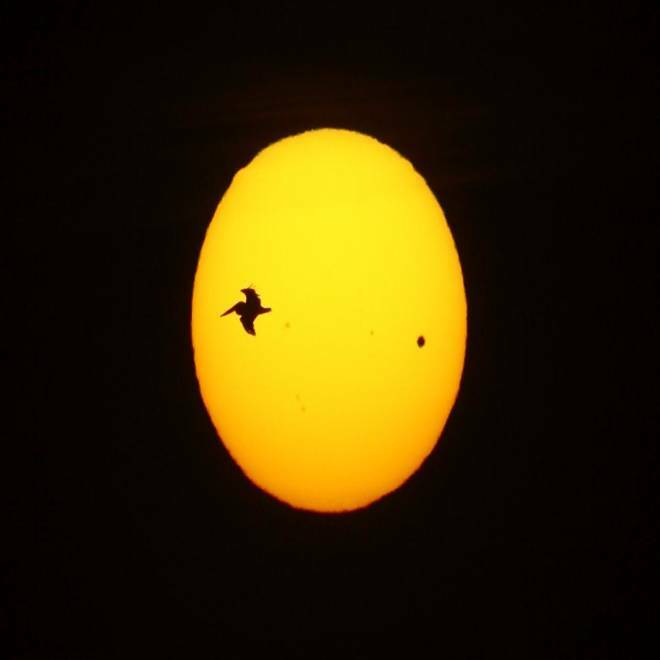 The amazing thing about this photo is that Elizabeth Ahlborn of Fond du Lac, Wis., used a pair of binoculars to project an image of the sun onto a white piece of paper. Then she took a photograph of the projection, which shows the black dot of Venus toward the bottom of the sun's disk, as well as sunspots. Thanks to everyone who submitted pictures, including Brian Helm, Adam Rybczynski, Jim Belfiore, Jacqueline Croasdale, Tommy Fortunato, Gary Brandon, Robert Schmidt, Steve Siedentop, Justin Van Hassel, Amy LeBaron, Xihui Zhang, Christopher Klug, David Hall, Jim Walsh, Bruce Korsmeyer (from Venus, Texas! ), Steve Moulding, Kevin Palmer, Don Heaton, Brian Sinofsky, Tom Rejzek, Dave Holbrook, Sean Kinslow, Ameer Hassoun, John Melson, Veronica Hernandez, Jarra McGrath, Jason Heinitz, Howard Chan, Sam Stouffer, Eric Steele, Tim Baker, Dinar Dalvi, James Owen and Andrew Lee. We won't have to wait until 2117 for the next astronomical photo op: Keep an eye out for coming attractions, highlighted by the Delta Aquarid and Perseid meteor showers of late July and mid-August.